Five-month-old Ronan Amador rides in a carrier with his mother, Elizabeth Mahoney, during a Planned Parenthood rally on the steps of the Texas Capitol on March 7, 2013, in Austin. Midland Community Healthcare Services Clinic in West Texas is open, and every day it's three lines deep as women file in for treatment. The clinic's 15 examination rooms go full throttle all day but can't come close to satisfying demand. The numbers are harsh. In Texas, just 22 percent of childbearing-age women who qualify for subsidized preventive health care treatment actually get it. The latest family planning predicament began in 2011 when the Republican-dominated Legislature decided it was done, once and for all, funding Planned Parenthood. It eliminated funding for any clinic associated with an abortion provider even if the clinic itself didn't perform abortions. In the process, the Legislature ended up slashing the state's family planning budget by two-thirds. Hampton says the Legislature's target was abortion, but the unintended consequence was that family planning clinics that had nothing to do with abortion, especially rural clinics, ran out of money. "So you had programs that would help patients pay for physician visits, obstetrical care, gynecological care, Pap smears. When all of that funding was removed and cut, a large number of women didn't have the means to pay for access to those services," Hampton says. The University of Texas' Texas Policy Evaluation Project has been investigating the statewide effects of the Legislature's family planning cuts. "Teens obviously, when they lose access, they don't have a lot of financial resources to go elsewhere for care so they may go without," says Kari White, one of the lead researchers. "Women who are not legal residents are in disadvantaged positions in multiple ways, and even women who are making just a little bit over the cutoff for the women's health program, $50 is still a lot of money out of your budget." The researchers found that two years after the cuts, Texas' women's health program managed to serve fewer than half the number of women it had before. The Legislature's own researchers predicted that more than 20,000 resulting unplanned births would cost taxpayers more than a quarter of a billion dollars in federal and state Medicaid support. White says that as the state has worked to rebuild its shattered network, the new providers don't necessarily have the same capacity to do cancer screenings and IUD insertions and birth control implants. "The Legislature wanted to make sure that ... even if [women] were accustomed to going to a certain provider that was no longer a part of the state plan, that there was another provider that was willing and able to take and serve women. So that's never an overnight process," says Lesley French, the Texas Health and Human Services commissioner, who runs the women's health services program. French says the state program is approaching the number of providers it had back in 2010. But in many regions of the state, there's been little or no decrease in the level of unserved need. Texas continues to grow vigorously, and a statewide doctor shortage compounds the problem. It's not like already inundated medical practices are champing at the bit to take on thousands of orphaned Medicaid patients. French says they're doing the best they can under the circumstances. "I'm very cognizant [that] the needs [of] one area of the state are not what the needs are in another area of the state. So what works in Houston, what works in Dallas, doesn't work for Midland," French says. "I'm really trying to recruit providers who can meet the people that we're trying to serve." The state's newest rendition of its women's health program debuts July 1. In the meantime, rural Texans still scramble to find family planning services — and not just poor women. Aubrey, a student at Texas Tech, doesn't want her last name used for reasons we'll explain in a moment. But last year, her senior year, her life changed. "Yes, I'd met a boy. I decided to go and seek out getting on birth control," she says. About to become sexually active for the first time, Aubrey did not want her birth control showing up on her parents' insurance, so she went to the student health clinic. But the doctor there was difficult. "I just wanted to talk to her and get some ideas on what would be best for me. And she was telling me that I needed to get on a certain one because that was my only option," she says. "It didn't really make sense. There wasn't a health issue, and it was kind of odd she was fighting me on this." "Planned Parenthood really changed my life. Quite honestly, I don't know where I'd be right now, if I hadn't been able to get in at Fort Worth," she says. "And so I'm glad I have the peace of mind now that I don't have to worry about getting pregnant when I'm not ready." And this is why Aubrey doesn't want her last name used — because she's a Planned Parenthood supporter living in West Texas. It hadn't been a problem until three months ago when a gunman attacked a Planned Parenthood clinic in Colorado Springs, Colo., a few hours to the northwest. A police officer and two Planned Parenthood clients were killed. In Texas, the Legislature seems determined that its robust anti-abortion politics will not further damage the state's women's health programs. But its battle against Planned Parenthood continues unabated. The state has ousted the organization from its cancer screening program, stripped it of state Medicaid money and is ending HIV-prevention subsidies. 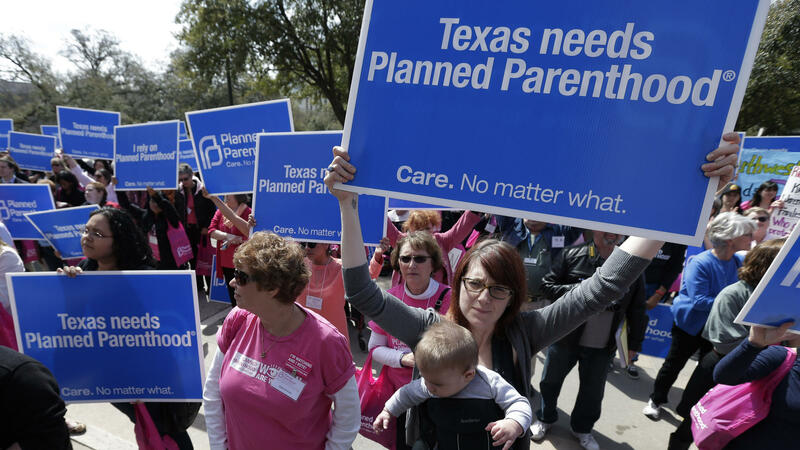 Texas is becoming the model for other conservative states that would like to defund all family planning clinics associated with abortion providers. In Texas, the legislature seems determined that its robust antiabortion politics will not further damage the state's Women's Health Programs. But its battle against Planned Parenthood continues unabated. The state has ousted the organization from its cancer screening programs, stripped it of state Medicaid money and is ending HIV prevention subsidies. Texas is becoming the model for other conservative states who'd like to defund all family planning clinics associated with abortion providers. Wade Goodwyn, NPR News, Midland. Transcript provided by NPR, Copyright NPR.